Twenty-four new conservation officers have joined the ranks of some of the most highly trained law enforcement professionals in Michigan. One of the most selective law enforcement academies in Michigan, the Michigan Department of Natural Resources Conservation Officer Academy held graduation today at the Michigan State Police Training Academy in Lansing. Thirty candidates initially were selected from nearly 500 applicants to be a part of Recruit School #9 – the DNR’s 23-week training academy. “This is the hardest academy in the state of Michigan – not many people get selected and fewer make it through,” said Conservation Officer Timothy Barboza, a Recruit School #9 graduate. The graduating six women and 18 men were challenged mentally and physically as they underwent training to qualify for the Michigan Commission on Law Enforcement Standards testing, in addition to specialized training in conservation law. “Conservation officers must be honest with their actions and with the public, passionate about helping Michigan’s natural resources and humble in their authority as an officer,” said Conservation Officer Anna Cullen, a Recruit School #9 graduate. While their primary mission is to enforce fish, game and natural resource protection laws, conservation officers serve a unique role as certified peace officers with authority to enforce all of Michigan’s criminal laws. Because of their specialized training and versatility, conservation officers often are first responders to situations involving medical emergencies, missing persons and public safety threats. “I am very passionate about being able to teach younger generations to enjoy and respect our natural resources, as well as passing on the traditions and heritage that I was taught at a young age – especially today, with technology consuming most young people’s time,” said Conservation Officer Jesse Grzechowski, a Recruit School #9 graduate. The academy began each morning with physical training, building the recruits’ strength to prepare them for physical fitness testing and the career demands of a conservation officer. Following physical training and room inspections, recruits received classroom instruction and various skills training. Each week recruits were tested through both written exam and mock scenarios. In the scenario testing, recruits entered staged situations in which they had to demonstrate their learned skills to resolve a conflict. The academy involved off-road training to operate specialized vehicles, such as four-wheel-drive trucks, ORVs and patrol boats – everyday tools used by conservation officers to patrol Michigan’s natural resources. Recruits took several trips to specialized training locations throughout Michigan, including the Camp Grayling Training Center, the GM Proving Grounds in Milford and Ingham County Jail, in addition to completing scenario testing at several parks. Next month, Michigan’s newest conservation officers will begin their probationary field training, partnered with veteran officers, and receive additional training prior to reporting to their permanent county assignments. Founded in 1887, the DNR Law Enforcement Division is Michigan’s oldest statewide law enforcement agency. Learn more about the work of conservation officers and explore the Recruit School #9 weekly blog posts and photos at michigan.gov/conservationofficers. 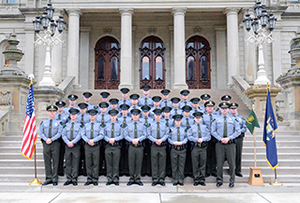 Recruit School 9 graduation-December 21 2018: The Michigan DNR Conservation Officer Academy graduated 24 new conservation officers in a ceremony that took place today in Lansing.